The land of Goddess Kali or Durga, Kolkata is bestowed with the beauty, brains and ethereal charm. This metropolitan city is the cultural epicenter connecting East India to the world. Once the British trading outpost, it rose to power by becoming the capital of British Imperial Empire. 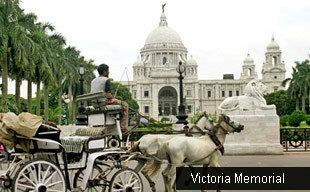 The traces of British aesthetics still depict the imperial times via Fort William, Victoria Memorial, Howrah Bridge, etc. A mishmash of various artistic hues in a colourful palette, Kolkata’s creative strokes fill the city with joys of life. 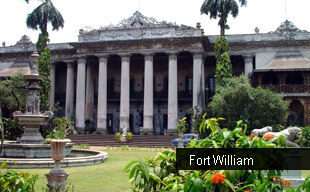 Fort William - One of the first British structures in East India, Fort William of Kolkata is a must visit attraction of this metro. Built on the banks of River Hoogly, the imposing structure was named after King William III of England. During the Battle of Plassey in 1757, Siraj Ud Daulah, the Nawab of Bengal regained the control over this fort after defeating the Britishers. This paved way for the construction of a new fort by Robert Clive. Currently, the grounds around this fort or Maidan form an important site for exhibitions and fairs. The must visit places in Fort William are the military area and arsenal. Victoria Memorial - Built in memory of the then British Queen, Victoria Memorial is another imperial structure modeled on Taj Mahal. Made of white marble, this monument is another magnificent trace of British royalty. Presently, a part of Victoria Memorial Hall also serves as a museum where tourists can see the exclusive photographs, statues and various other items belonging to the British Raj. Howrah Bridge - Often pictured as an iconic landmark of Kolkata, Howrah Bridge or Rabindra Setu is a 700 m long busiest bridge, not only in India, but worldwide. The beauty of this strong cantilever bridge can be explored on a river ferry floating on the Hoogly River, a tributary of Ganges. Kalighat - Kalighat remains one of the busiest sites in Kolkata because of the reverence of this temple. The ardent devotees of Goddess Durga offer red Hibiscus and worship her in true devotion seeking strengths. The holy dip at Kalighat, the banks of River Ganges is also performed with reverence in this temple complex. By Air – Being one of the metropolitan cities, Kolkata is ideally connected, nationally and worldwide. By Road – Kolkata’s easy road connectivity with the Eastern and North-Eastern India make it an interesting base city. By Railways – Howrah & Seldah Railway Stations link Kolkata to major Indian cities. Climate – The climate of Khajuraho swindles towards extremes. Summers are too hot whereas winters are pleasant. The best time to explore the city of Khajuraho is from September to March. A dream realised of Rabindranath Tagore, Shantiniketan is a university town mainly known as the home of this revered poet. This town is a meeting point of western & eastern influences and a flourishing abode of creative talents in Vishva-Bharati or Rabindra-Bharati University. This place is also a tourist attraction as Tagore penned many of his literary classics in the peaceful surroundings of Shantiniketan. The experiement of studying in company of nature formed an important landmark in the journey of Shantiniketan as it widened the scope of students. This novel way of education in Shantiniketan has produced geniuses like Nobel Laureate Amartya Sen, Former Prime Minister Indira Gandhi, Filmmaker Satyajit Ray and Queen of Jaipur, Gayatri Devi. One of the natural wonders of Indian wildlife blessed with the presence of Royal Bengal Tiger, Sundarbans Wildlife Sanctuary is the world's largest mangrove forest. Recognized as a world heritage site, this beautiful forest is surrounded the largest delta formed by communion of River Ganges, Brahmaputra and Meghna. Located in the south Kolkata, Sundarbans wildlife sanctuary is a rich place to explore the animals and birds like monkeys, spotted deer, Saltwater Crocodile, herons, eagles and kingfishers in mangrove swamp forests. The quaint hill station of West Bengal, Darjeeling evokes sensory experiences of a lifetime. Bordered by snow clad mountains and valleys, this hill station is famous worldwide for its acres of tea gardens and toy train running on a narrow line. Just eight hour drive from Kolkata, Darjeeling is a soothing retreat to relax in the lap of nature. A weekend retreat in Kolkata, Botanical Gardens provides a great way to venture out in the natural territory of the city. Located just 8 km away from the city center, this garden takes pride in showcasing a great variety of around 12,000 plants, trees amidst a vast expanse of greenery.